Appearing on the Cambridge University News website are photographs of the Cambridge Archaeological Unit’s (CAU) excavations at Must Farm, near Whittlesey. These are a selection of the photographs and you can view the rest of them here. Discovered at Hanson’s brick clay quarry, the site is a palaeochannel of the River Nene and would have been on the edge of the prehistoric Fenland Basin, in close proximity to the previously excavated Flag Fen. 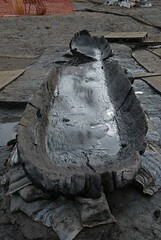 The waterlogged silt deposits at Must Farm have created exceptional preservation conditions for six oak log boats, twelve eel traps and numerous swords and spears which span the Bronze Age. 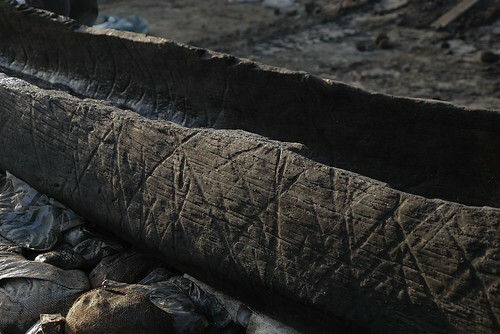 Hailed as some of the most important prehistoric finds in Europe by the archaeological community, CAU aims to raise the boats before Christmas ready for long-term preservation and will continue excation of the site into the new year.